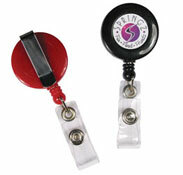 CUSTOM PRINTED AND BLANK BADGE REELS AT WHOLESALE PRICES! 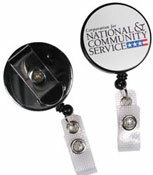 BADGE REELS AT THE LOWEST PRICES! 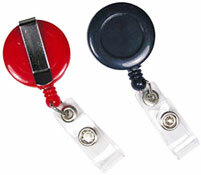 NOW AVAILABLE...OVERRUN BADGE REELS...WHILE THEY LAST! We are a badge reels manufacturer and wholesale supplier of blank and custom printed reels in a variety of styles and configurations. From the least expensive economy reels in round and square shapes to metal and heavy duty badge reels with reinforced nylon or steel cords. 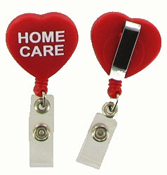 Badge reels with a retractable cord are a convenient way to carry id cards, name badge holders and other small objects such as keys, pens and small tools. The retractable cord comes in handy when id cards have to be displayed often throughout the day. 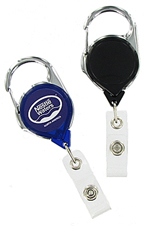 For id card swiping and keyless entry systems retractable reels are the ideal choice. Blank reels are also available at the absolute lowest wholesale prices starting at only $0.45 ea! They are available with either a belt clip or spring (alligator) clip on back. 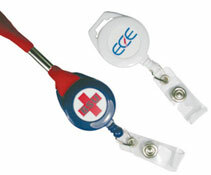 Rush service is available on most custom badge reels: Choose from:1-2 days, 3-5 days or 7-10 days. Please contact us for details. 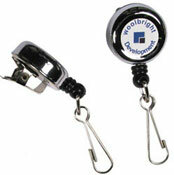 Learn more about retractable reels with these Informative Badge Reels Articles from badge reel function and reel anatomy to unique styles and modern custom imprinting methods.